The government is (partially) shut down, yet I’m not happy or excited. 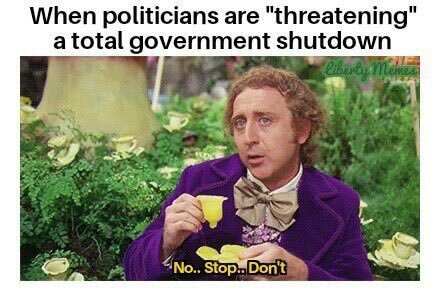 That’s because Washington isn’t fighting about something I care about, such as the near-shutdown over spending levels in 2011 or the shutdown over Obamacare in 2013. Instead, the latest drama in Washington is because Trump wants money for a border wall, which is an issue that doesn’t motivate me (though I keep asking my GOP friends why they don’t propose to finance the wall by cutting back on wasteful domestic programs). 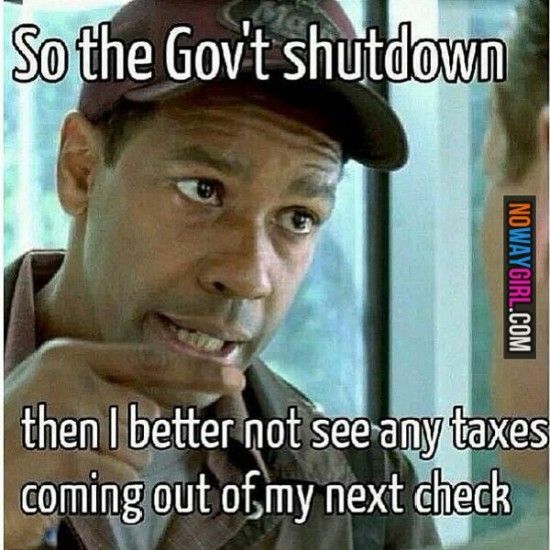 But at least this battle gives me an opportunity to augment my collection of shutdown humor. My favorite for today comes from libertarian Reddit. Amen. As Jay Leno joked back in 2013, the real problem is that politicians eventually figure out how to get the government going again. Sticking with that theme, let’s enjoy excerpts from some satire by Babylon Bee earlier this year. 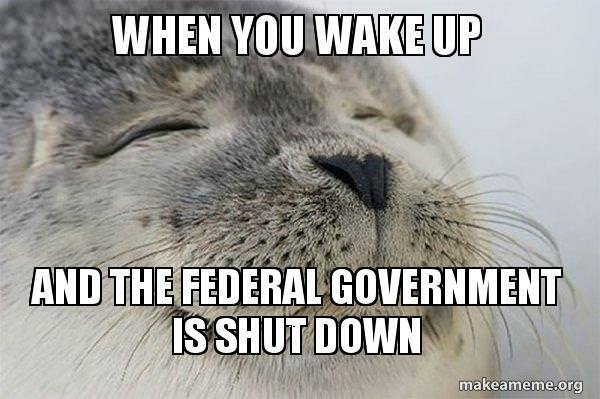 As the federal government faces a shutdown…, millions of Americans reported…a sense of relief washing over them like a wave of peace and serenity at the possibility of a powering-down of our volatile governing bodies. “Maybe it wouldn’t be so bad if the federal government would just close up shop and go away for a little while,” one smiling man told reporters. “They’re such a source of strife and frustration in our daily lives—we need a little peace of mind. I really hope they’ll go ahead and take a little break.” “Don’t worry about us, politicians—we’ll be fine. Just go ahead, shut her down and take as much time as you need,” he added. So even if it’s only a partial shutdown, and even though it’s not for the reasons I would prefer, I still share the sentiment in the Babylon Bee article. Which is a good segue to an amusing image from Imgur. The seal in the above image should thank Hank Stanson, at least according to another article from Babylon Bee. I’ve also been a good boy. I waited a full week after George H.W. Bush died before pointing out that he was not a good president. 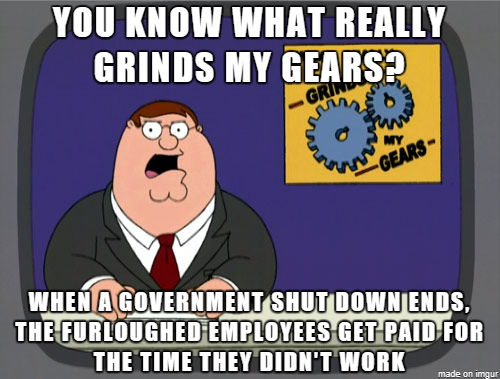 On a semi-serious note, it’s worth noting that shutdowns don’t actually save any money. Notwithstanding this bit of satire, we still have to pay taxes. And the vast army of minions in the federal bureaucracy get paid for sitting at home. That’s the message in another contribution from Imgur. To be fair, I don’t actually object to bureaucrats getting paid during shutdown. I’m much more concerned that they oftentimes work for agencies and departments that shouldn’t exist. Which brings us to the final bit of humor for today. 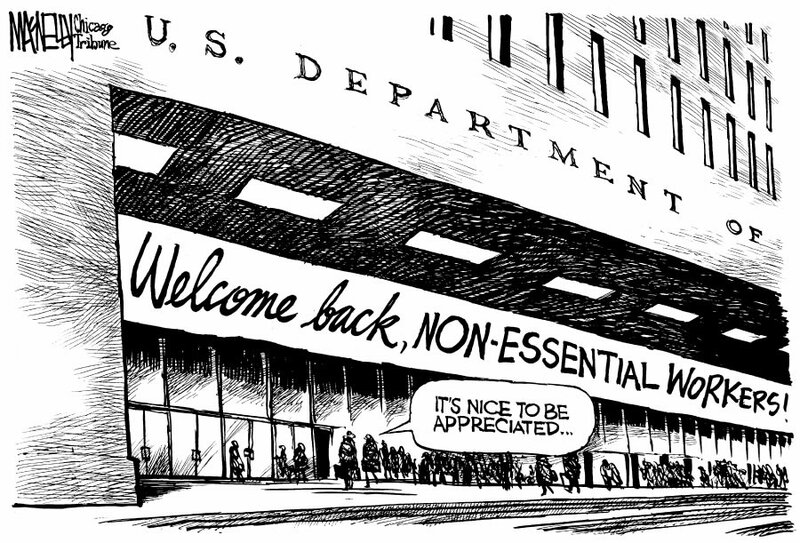 Every employee at the Department of Housing and Urban Development is nonessential. The same is true for the Department of Education, Department of Agriculture, Department of Transportation, Department of Energy, and many other boxes on the federal flowchart. P.S. I linked above to a couple of prior examples of shutdown humor. You can enjoy other editions by clicking here, here, and here. P.P.S. People say fiscal policy is dry, but we’re actually fun-loving people. There’s also debt-limit humor and sequestration humor. Amen Daniel! Here is a Daniel Mitchell-inspired podcast episode on this topic I recently published. I’m convinced that we could remove fifty percent of the federal bureaucracy and very few people in the private sector would notice. Hell, we could probably save thirty percent just by removing the duplication between agencies. 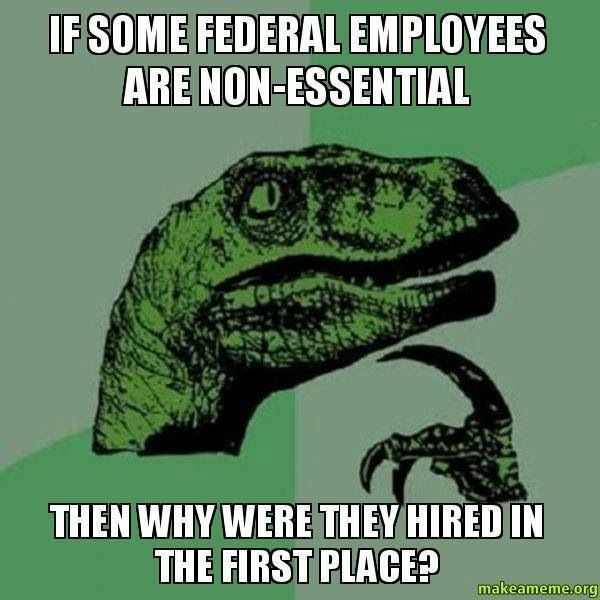 Proving that government exists outside the “real world”…in RW—“non-essential” employees have another name: unemployed. Interestingly enough one of the few constitutionally decreed duties of the fed G is “homeland security”, the main part not yet funded. No fan of its current convoluted unconstitutional form it nevertheless has more right to taxpayer funding than much else that’s fully funded even has to exist.